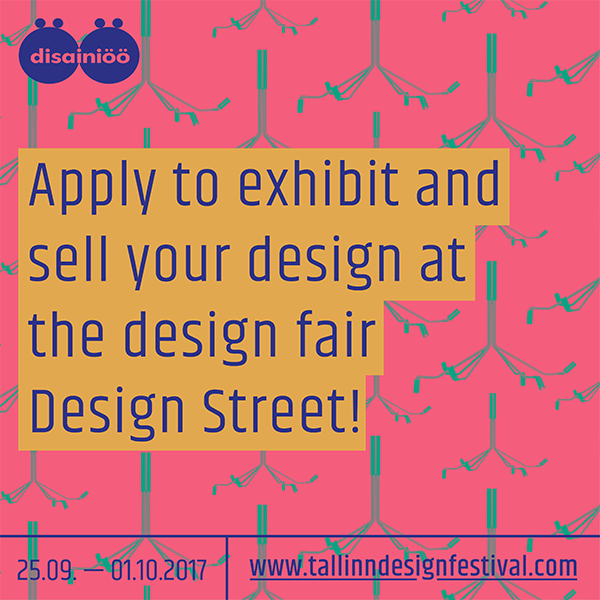 Apply now for Designstreet design fair as part of the 12th Tallinn Design Festival! The fair will take place from September 29th to October 1st 2017 at Noblessner Foundry. We look forward to seeing desigers and companies from all the fields of design. In order to apply, please fill the application form HERE. We also have a special early-bird offer for early applicants! The application deadline is August 31st, 2017. The space is limited, so hurry! Last year the design fair had over 3000 visitors. Check the spirited gallery of last years Designstreet from HERE and HERE. Designstreet is open for visitiors from 12PM - 7 PM on the 29th and 30th on September and 12PM - 6PM on the 1st of October at Noblessner Foudry (Tööstuse 48, Kalamaja, Tallinn). We offer you stands of 3 different size, from which to choose. The early-bird special offer is valid unitl the 15th of August, 2017. The fee excludes the rent of tables or chairs. The fee includes: participation fee, standspace rent, general organization and marketing (companys logo and contanct information on Tallinn Design Festivals webpage and Facebook page), 2 identification cards. We will arrange one power outlet for each stand. Additional extension cords must be brought by participants. As the space is limited, the number of patricipants is also limited! We publish the list of participants on the festivals wepage and Facebook page. Each participant will be sent a confirmation and an invoice on the e-mail address written in the application. The invoice must be paid on time. If not, the organizers have the right to annul the participation.